The cloud that surrounded the city’s embattled downtown development agency since its inception has finally swallowed it up. Attorneys for the city and a former board member of Civic announced Friday they had reached a settlement that calls for the city to sever its ties with the nonprofit and bring its permitting, planning and parking district oversight back to the city. Downtown boosters and city leaders who championed the agency despite years of pushback are now being forced to embrace a new vision for Civic San Diego and the downtown planning process. Downtown will soon lose the last remnants of the agency that more than any other is responsible for the way it looks and feels today. The settlement follows a 2015 lawsuit that led to more than a year of negotiations between city and labor union leaders about the future of the unique nonprofit. The City Council, which signed off on the arrangement behind closed doors last month, is poised to soon finalize changes that union leaders have urged since Civic San Diego’s emergence. Union leaders and community activists have long alleged that Civic San Diego is too cozy with developers and rampant with conflicts of interest. They finally notched a victory in their years-long effort to dial back Civic San Diego’s powers in an era when their power at City Hall has peaked, coinciding with a veto-proof Democratic majority on the City Council. Their victory paves the way for a more progressive City Council to weigh in on major downtown developments, making it likelier that hotels or construction projects strike labor-friendly pacts. Former Mayor Jerry Sanders and past city leaders created Civic San Diego in 2012 during another chapter of city history where discussions about downtown revitalization reigned – but at that time, union leaders had less influence at City Hall. Civic San Diego emerged in the shadow the city’s two scandal-plagued redevelopment agencies. Faced with the state’s decision to end its property-tax funded redevelopment program, boosters and developers who had made their careers on the redevelopment-backed transformation of downtown were determined to hold onto the model that they had long relied on. Sanders and others decided Civic San Diego, a new nonprofit development agency, should oversee the wind-down of urban renewal projects that had been approved before the state ended the redevelopment program. They also decided Civic San Diego should regulate private development downtown, a bet that a developer-friendly entity separate from the city could usher in private development more quickly than City Hall. If the experiment worked, downtown boosters and development advocates suggested, that model could be expanded citywide. Civic San Diego and its supporters have instead spent nearly seven years fighting for its existence. They have weathered a legislative threat, legal challenges and allegations of mismanagement and conflicts of interest involving both board members and agency leadership. Developers and some downtown advocates are adamant Civic San Diego has been a success. They say Civic San Diego has sped up development and that the agency has provided design oversight that’s helped ensure more cohesive development. “I think San Diego kind of set the standard through Civic San Diego,” said Michael Johnson, confounder of design firm Carrier Johnson, which has worked in cities around the world. Civic San Diego’s processes and other reforms meant to ease downtown development have made the area one of the most efficient to build in, Johnson said. Now, in response to legal challenges, city leaders are pledging to bring some of the agency’s most high-profile functions back to City Hall. They are also promising to apply lessons learned at Civic San Diego citywide, such as assigning staffers who are knowledgeable about specific communities to work on projects in those communities. “That work and that experiment of Civic San Diego will continue on inside of the city of San Diego,” Deputy Chief Operating Officer Erik Caldwell said. Mayor Kevin Faulconer, development advocates and city bureaucrats have held onto the original vision for Civic San Diego despite repeated attacks and arguments that the city – not Civic San Diego – should hold sway over downtown planning and permitting. Civic San Diego clashed with community groups, especially unions, within months of its creation in 2012. It tangled with the Municipal Employees Association, the labor union that represents city planners and other city employees, as it sought to take over permitting and planning authorities in two former redevelopment areas outside downtown. Assemblywoman Lorena Gonzalez, a former labor leader, even introduced state legislation in 2015 to try to hand Civic San Diego’s downtown development authority back to the City Council. Then-Gov. Jerry Brown vetoed the bill. Then came former Civic San Diego board member Murtaza Baxamusa’s 2015 lawsuit, which alleged the city wasn’t allowed to delegate planning and permitting authorities to Civic San Diego. Baxamusa wasn’t seeking cash. He wanted to overhaul Civic San Diego, and his lawsuit ended up being labor’s most successful weapon. Baxamusa’s lawsuit also unearthed a series of complaints about lacking internal controls, mismanagement and conflicts of interests at Civic San Diego that amplified his case and the controversy surrounding the agency. More than a year ago, city officials and Baxamusa – who is affiliated with the county’s largest construction workers union – began negotiating a potential settlement behind closed doors. 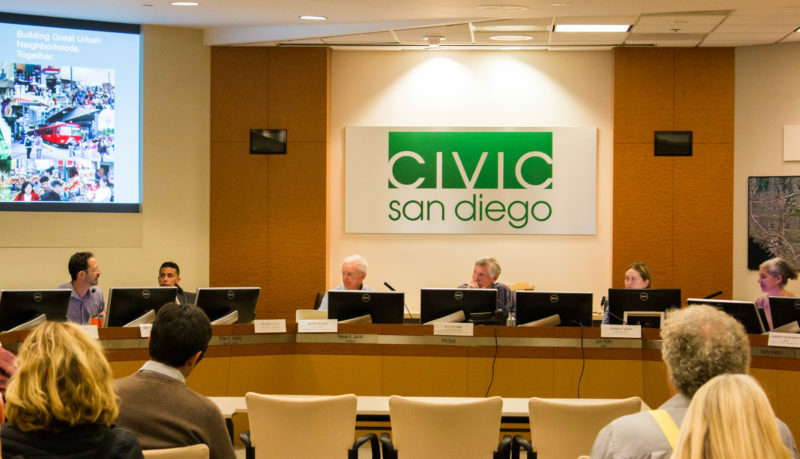 Weeks after those negotiations kicked off, then-Civic San Diego president Reese Jarrett abruptly announced that he would retire, only adding to the uncertainty about Civic San Diego’s future. And last August, as those talks dragged on, the city’s Ethics Commission fined then-board chair Phil Rath for failing to reveal his financial ties to a developer whose project appeared before the Civic board. On Friday, attorneys for the city and Baxamusa announced they had cut a deal that would scuttle the agency’s most high-profile duties. Baxamusa is also expected to receive $725,000 to cover his legal costs. San Diegans for Open Government, which filed a similar case last year, could also receive up to $25,000 for attorney’s fees, per the settlement. Downtown developers and advocates are waiting to hear how services will change once they are moved back to City Hall. For now, they are concerned downtown projects could soon face the same treatment as others across the city – with a more hands-off approach from city staff. For years, downtown developers and residents have come to expect access to Civic San Diego staffers who understand the nuances of downtown, and detailed discussions about project design that don’t always play out elsewhere. They have also come to expect swift project timelines unmatched outside downtown. “Civic was the one place where there was an actual process in place to kind of work with the city, through Civic, on design issues and things like that, which I hate to lose,” said developer Frank Wolden, who once worked at the city’s former redevelopment agency. Wolden fears all of that could be lost under the settlement. At City Hall, he said, the focus is often strictly about compliance with city codes rather than on design issues or how a project might fit into a neighborhood. Gary Smith, president of the Downtown Residents Group, worries downtown projects with commitments to deliver on community improvements could take a backseat once the city takes over. “Those improvements will sit behind anything that’s in the queue because they certainly aren’t going to disturb the queue to take care of downtown,” Smith said. Former city planner and architect Mike Stepner said he believed the city could choose to mimic Civic San Diego’s more proactive stance on development. “My concern is we still need that kind of active engagement with development and redevelopment to help revitalize many of our neighborhoods,” Stepner said. Baxamusa and labor leaders said they believe the settlement will force builders to address resident and labor concerns about projects. They have argued that Civic San Diego’s structure and lacking oversight from City Hall translated into far fewer discussions about how downtown projects might address or create local infrastructure needs or affect housing affordability, or about labor issues tied to those projects. The City Council, on the other hand, is more equipped to demand more of developers. “The game-changer here is we will no longer have a semi-private entity issuing permits downtown to developers,” Baxamusa said. Now the city and Civic San Diego are preparing for a new future for the agency. As redevelopment-funded projects and commitments have wound down, the agency has sought to build up its other portfolios. The agency has successfully sought and earmarked more than $130 million in federal New Markets Tax Credit funds meant to support investments in low-income communities. In the process, Civic San Diego has supported projects including the Access Youth Academy facility and the Jackie Robinson Family YMCA in southeastern San Diego. Andrew Phillips, interim president of Civic San Diego, said the agency is also working to build up a fund to support middle-income housing development across the city and to continue its community lending efforts. Now Civic San Diego is likely to perform those functions as a private nonprofit rather than an arm of the city. Civic San Diego board members say they are relieved the years-long fight is behind them. Some even say they consider it a new start. Rath, the former board chair who was once among many downtown boosters adamant about the necessity of Civic San Diego’s permitting authority, struck a similar tone. Rath acknowledged that some might view Civic San Diego as a shell of its former self but said he had concluded fights over the agency’s structure were a distraction from what it could actually accomplish. The settlement, Rath and others decided, was the way to move forward.